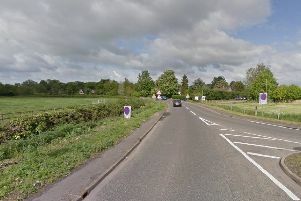 A serious car crash has closed Crowland Road in Eye in both directions this afternoon, Friday September 1. The road is shut between Eye Green and the junction of the B1443 while police deal with the crash. The vehicle involved in the single car crash has overturned and entered a ditch. Emergency services were called at 2.19pm. There are suspected serious injuries and fire crews and the air ambulance are at the scene. Motorists are asked to find alternative routes.